Thinking of performing a Unity Sand Ceremony on your special day? You've come to the right place! Many couples use the same color sand as the accent colors for their wedding- i.e. if the bridesmaid dresses are light blue, then the gentleman uses light blue and the bride uses white, or vice-versa. Order plenty of the sand and use as accents on the reception tables, even in the flower vases. Small containers with colored sand make the perfect backdrop for shells, decorative rock, or shiny costume jewelry- depending on your theme. 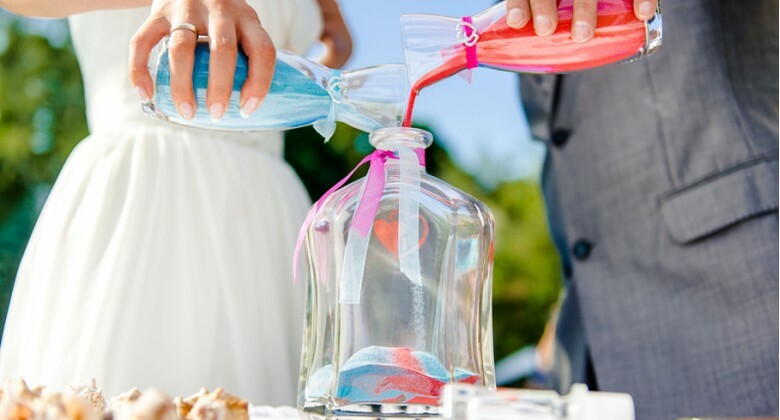 Layer the bride and groom sand colors in decorative clear plastic or glass containers and use to accent the food tables. Many people find it helpful to order a colored sand sample set to be able to choose their colors. Choose a wide-mouthed container (a wide-mouthed florist's vase works well) for the ceremony, then you may transfer the combined sand later into a permanent display container. The following is an example of wording for the ceremony. Plan to have soft music playing during this part of the service. After the minister reads the statement below, pour two containers of sand into a third, wide- mouthed, container simultaneously: _______________ and ______________, today you join your separate lives together. The two separate bottles of sand symbolize your separate lives, separate families and separate sets of friends. They represent all that you are and all that you’ll ever be as an individual. They also represent your lives before today. As these two containers of sand are poured into the third container, the individual containers of sand will no longer exist, but will be joined together as one. Just as these grains of sand can never be separated and poured again into the individual containers, so will your marriage be. If children are a part of the new family, the sand ceremony can involve them also. Some families choose a different color for each member. (This can be tricky -to get colors that complement each other. Lots of different colors together end up looking dirty and brown from a distance. We advise you practice this a few times using a small amount to make sure you like the results.) This is much safer than having small children handling lit candles!